India has one of the largest visually impaired populations in the world—15 million people strong, to be exact. But although 80 percent of cases are either preventable or treatable, rampant discrimination prevents most of the country's blind from sustaining meaningful employment. A new social enterprise, however, seeks to change all that. 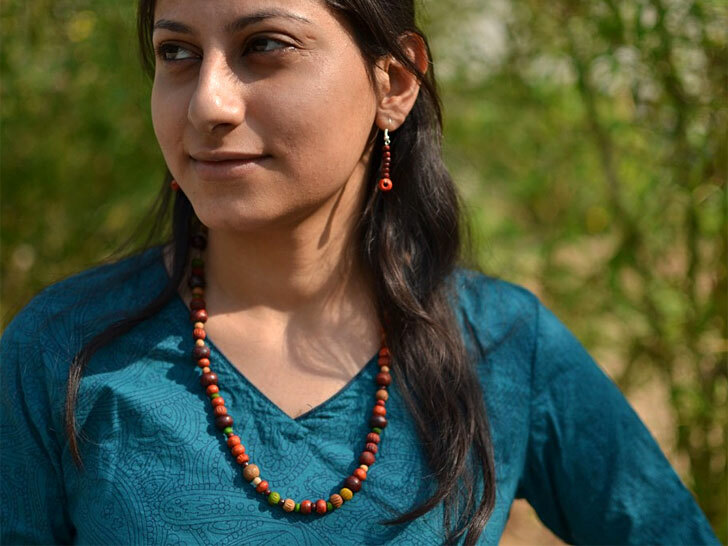 A partnership between students at the Royal College of Art in London and the Indian National Institute of Design, "Made in the Dark" is a line of handmade jewelry that relies on the craftsperson's sense of smell, rather than sight. The Made in the Dark team worked with the nonprofit Andh Kanya Prakash Group School and the Blind People’s Association in Ahmedabad to develop a unique “color-scent language” that associates individual colors of beads with specific aromas, say lime for bright green or sandalwood for burgundy. Using the art of “scent-beading,” blind artisans are able to manipulate the products they create. Using this new art of “scent-beading,” blind artisans, particularly those with prior skills, are able to manipulate the products they create to communicate both visually and olfactorily. The impact of the brand, once established, could have far-reaching consequences. Growing demand for products would not only encourage veterans of the craft to train other blind people, but also create a sense of community and camaraderie. “The blind craftsmen would pick up new materials and drop of their latest designs on a set day so that they maintain social contacts with other blind people if they are working from home,” they add. Made in the Dark also sees itself as a voice for promoting awareness about preventable blindness. A sunglass chain that encourages people to wear sunglasses, for instance, could help reduce cases of cataracts or macular degeneration that frequently result in vision loss. 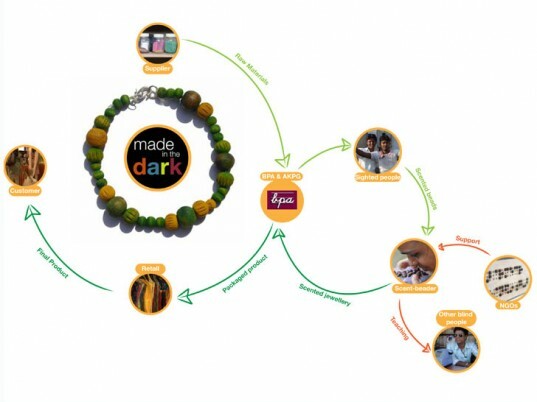 The Made in the Dark team worked with the nonprofit Andh Kanya Prakash Group School and the Blind People’s Association in Ahmedabad to develop a unique "color-scent language" that associates individual colors of beads with specific aromas, say lime for bright green or sandalwood for burgundy. Using this new art of "scent-beading," blind artisans, particularly those with prior skills, are able to manipulate the products they create to communicate both visually and olfactorily. "By combining different aromas with colored beads, a relationship between color and scent can be developed which gives craftspeople the opportunity to discover and control color in their work," wrote Jon Fraser, Hal Watts, and Ruby Steel in their project report. "By initializing the craft in local NGOs, we hope to develop an artform that will be free to grow and evolve throughout the blind community." The impact of the brand, once established, could have far-reaching consequences. Growing demand for products would not only encourage veterans of the craft to train other blind people, but also create a sense of community and camaraderie. "The blind craftsmen would pick up new materials and drop of their latest designs on a set day so that they maintain social contacts with other blind people if they are working from home," they add.